Sapporo Ramen in Cambridge, Massachusetts. Minnesota Prairie Roots file photo May 2016. MY FIRST AND ONLY ATTEMPT ever to eat with chopsticks happened nearly two years ago at Sapporo Ramen in Cambridge, Massachusetts. I tried to position my fingers like my son demonstrated, to clamp the slippery ramen noodles between thin sticks and then maneuver the food to my mouth. I failed. A ramen dish at Sapporo Ramen, Minnesota Prairie Roots file photo May 2016. I was hungry. A spoon would work just fine, thank you. I’ll admit, I haven’t had all that much exposure to ethnic foods. Choices are limited here in Greater Minnesota, the name tagged to any place outside the Twin Cities metro. Typical restaurant fare around here is standard American. Any ethnic restaurants are primarily Mexican. One of my favorite burgers, the Strawberry Hill Burger, served at Fielder’s Choice in Northfield, Minnesota. The burger features peanut butter, strawberry jam, pepperjack cheese and bacon. Minnesota Prairie Roots file photo. I often wish we had more creative choices in dining. But the reality is that folks seem to like the usual burgers and fries, chicken sandwiches, deep-fried fish, the occasional steak—familiar foods to Minnesotans. The Amboy Cottage Cafe. Minnesota Prairie Roots file photo July 2013. Because of cost, I don’t dine out all that often. So when I do, I want something different, something I can’t prepare at home, something tasty and fresh and definitely something made from scratch. When I think about really good food that I’ve eaten at Minnesota restaurants, two places pop to mind—The Amboy Cottage Cafe and The Good Life Cafe. My incredible raspberry chicken salad. Minnesota Prairie Roots file photo July 2013. Spaghetti with homemade meatballs and sauce. Minnesota Prairie Roots file photo July 2013. Homemade blackberry pie. Minnesota Prairie Roots file photo July 2013. Five years ago Randy and I ate at the Cottage Cafe in Amboy south of Mankato. We specifically stopped in this small town to dine in the 1928 cottage style former gas station. I’d read about the great homemade food. There I enjoyed the best salad ever—raspberry chicken—while Randy had spaghetti with homemade meatballs and sauce. Both were superb as was our shared slice of blackberry pie. I need to revisit this restaurant. My Chicken Wild Rice Hotdish with salad and bread on the side from The Good Life Cafe. Minnesota Prairie Roots file photo September 2017. Some 4.5 hours to the north in the tourist community of Park Rapids I found another hometown restaurant that served up one memorable dish. That would be The Good Life Cafe and the Chicken Wild Rice Hotdish. I loved the creamy, savory flavor of the hotdish (casserole to those of you not from Minnesota), so comforting and delicious on a cool and rainy September day. How about you? 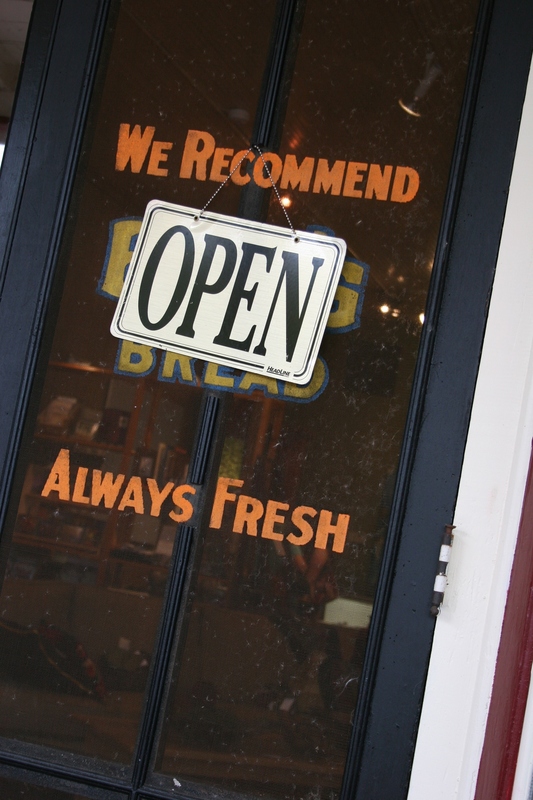 What do you look for when dining out? Tell me about a favorite restaurant and/or meal. I’m especially interested in hearing about restaurants in small (Minnesota) towns. On the way to St. John’s United Church of Christ, located between Faribault and Kenyon just off Minnesota State Highway 60 on Jacobs Avenue. That’s the church in the distance, on the left. 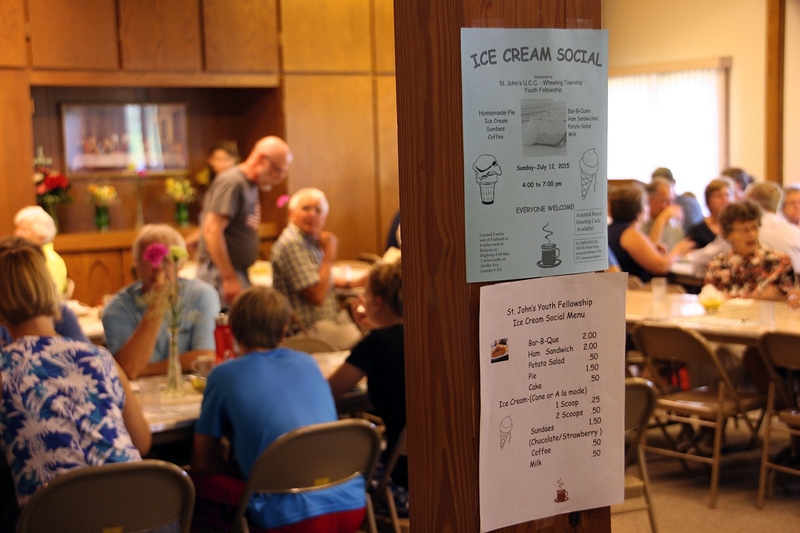 ALL ACROSS MINNESOTA, in church basements and fellowship halls, parishioners are plating pie and scooping vanilla ice cream. It’s the season of ice cream socials. 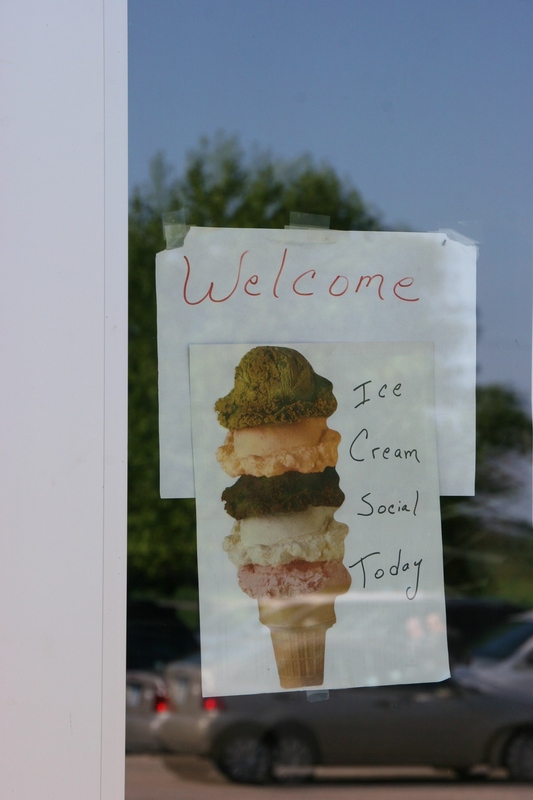 This simple sign on the door into the fellowship hall welcomes diners to the Ice Cream Social. Sunday I attended the annual Ice Cream Social sponsored by the Youth Fellowship of St. John’s United Church of Christ, Wheeling Township, rural Faribault. Lynn, left, and Kim, right, make sandwiches. While the youth scooped ice cream, collected money, served beverages, cleared and set tables, the adults mostly manned the kitchen. Kim prepared ham sandwiches while Lynn made BBQs. One volunteer was kept busy restocking pies and taking orders for specific pies. 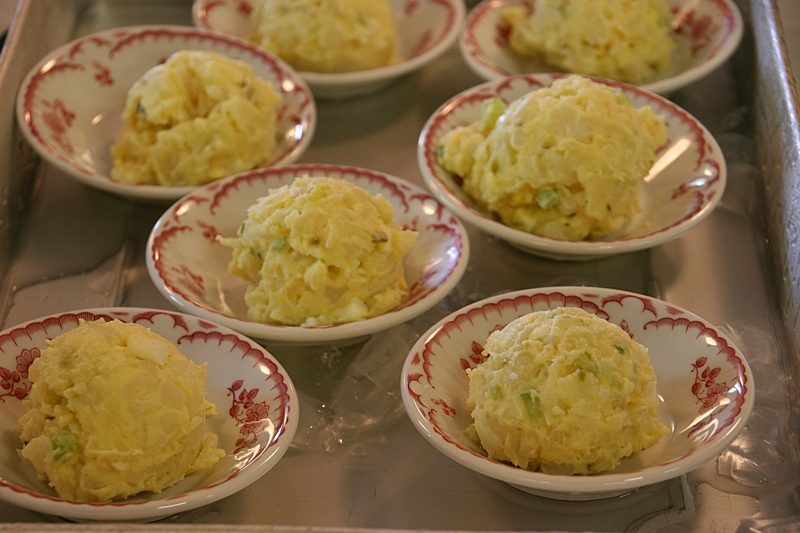 Potato salad on ice, ready to go. 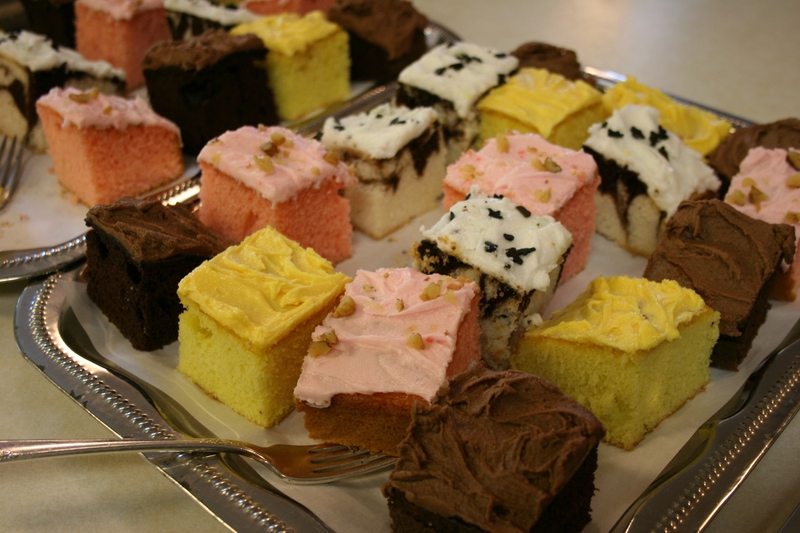 Cake was available, too, for those who preferred or wanted that sweet instead of/in addition to pie. Others kept the pie counter full, washed dishes, restocked pickles and potato salad and more. Craig scurried around the dining area with a pot of coffee in one hand, a pitcher of water in the other. The door to the Pie Room is labeled as such. 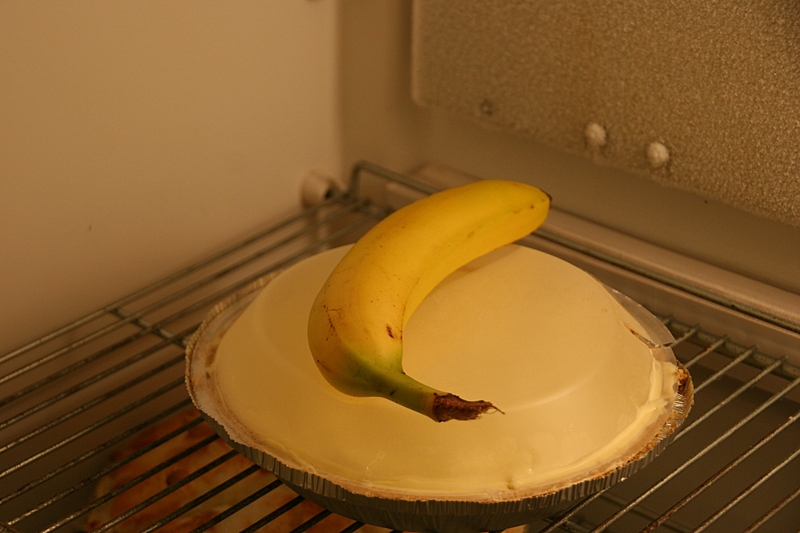 Banana cream pie inside a Pie Room fridge. Elsie, hard at work in the Pie Room. She turns 90 in October. 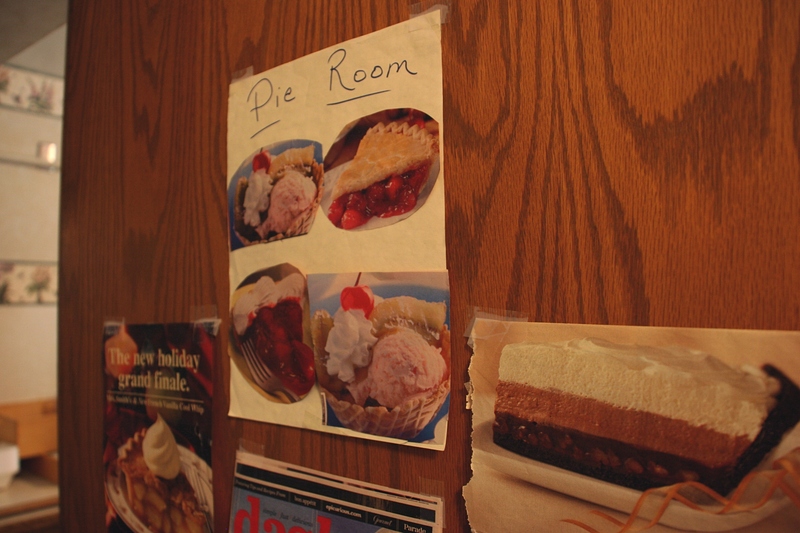 And, in a narrow room off the kitchen, in a space officially dubbed “Pie Room,” 89-year-old Elsie plated pies. 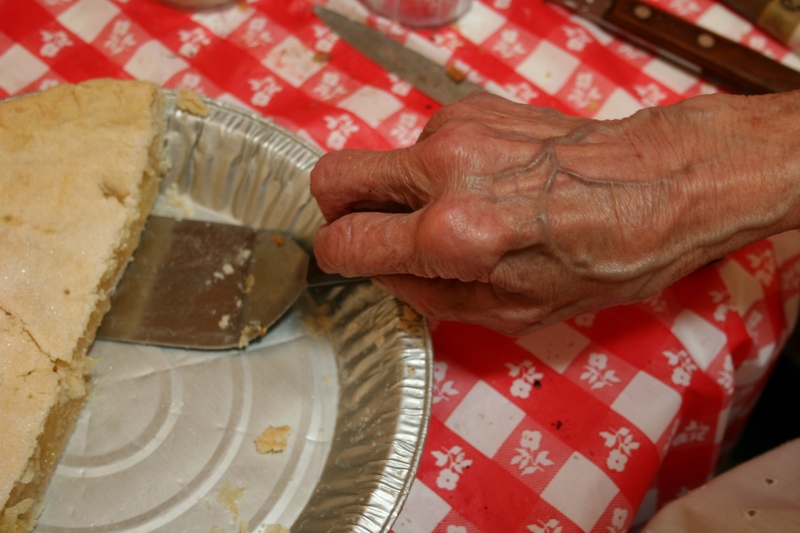 I marvel at this petite life-long St. John’s member who, with arthritic hands, tirelessly cuts and plates pies at a fast pace and then slides the plates through a small window onto the kitchen counter. 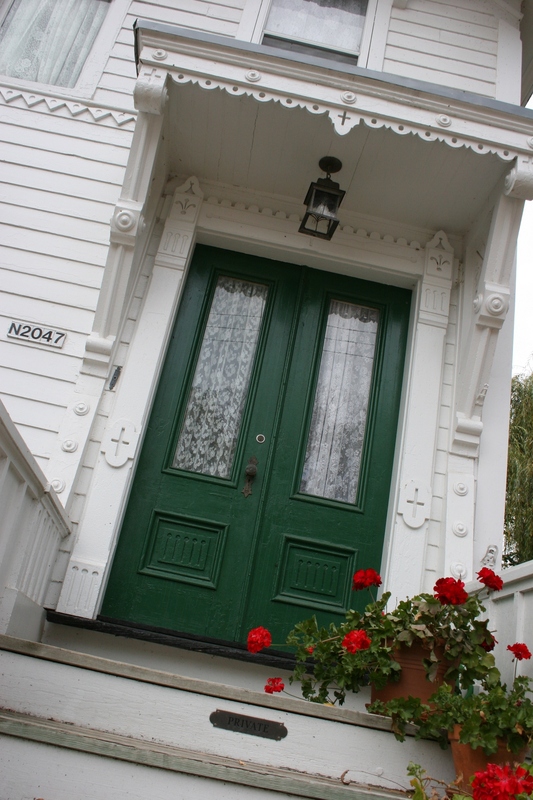 I hugged her upon my arrival and she welcomed me with a kind and gentle spirit and sweet smile. I love Elsie. 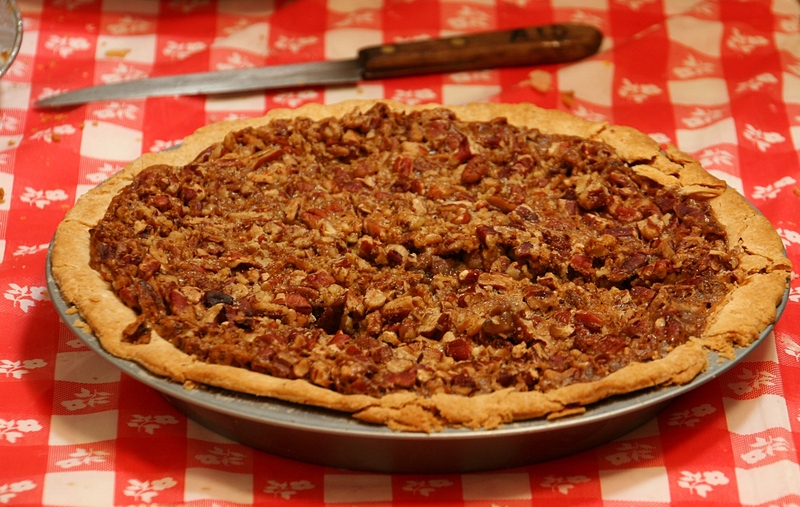 It’s all about the pie at the St. John’s Ice Cream Social. Just look at this lovely lemon meringue. And I love this congregation of friendly and faithful people who minister through delicious homemade food. St. John’s also offers weekly soup and salad luncheons during Lent and each fall hosts a German Fest featuring superb Deutsche Essen. 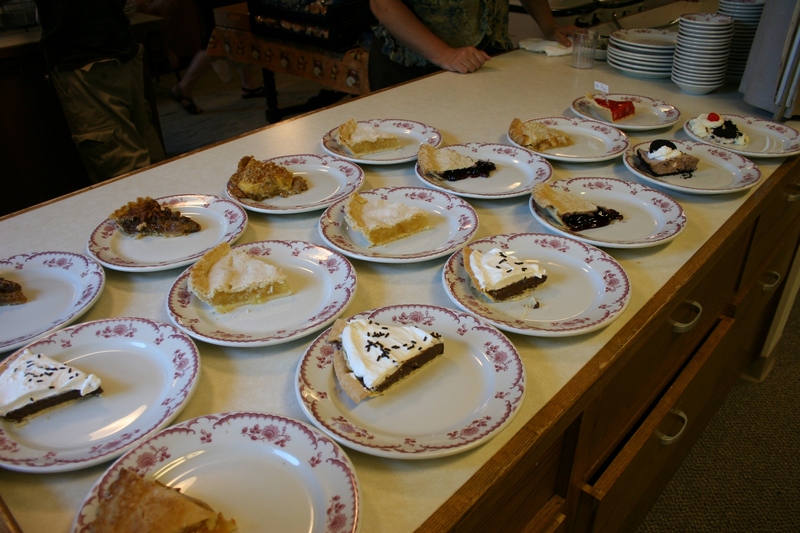 Parishioners made 28 pies for the Ice Cream Social. The varieties included pumpkin, pineapple, peach, strawberry, cherry, custard and more. 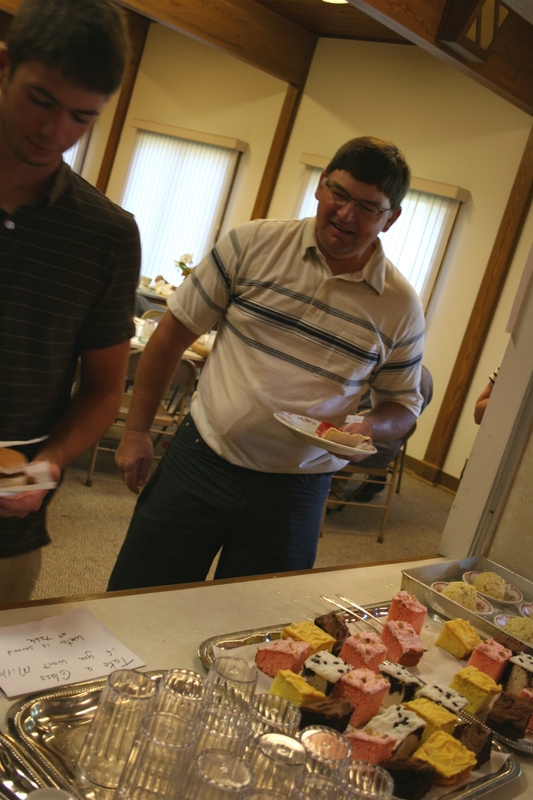 If you are a fan of church meals, as I am, you likely have favorite ice cream socials or dinners. I’d like to hear where those are. Pie cost $1.50 per slice. 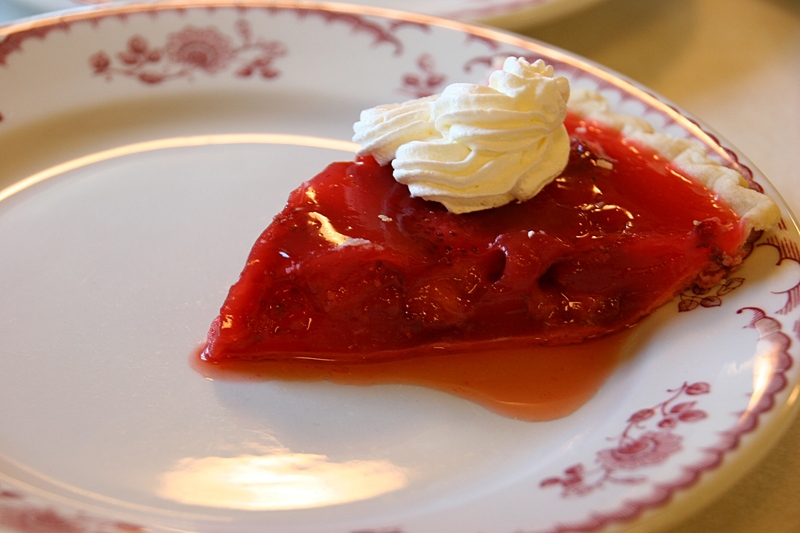 This is strawberry, likely Elsie’s as she brought strawberry pie. Have you gotten to know the faithful who labor in the kitchen, who truly deserve hearty thanks for blessing us with their tasty homemade cooking and baking? Thank you, St. John’s United Church of Christ, Wheeling Township, for the great fellowship and food. MY FRIEND MANDY is sweet and giving and super smart. She is also a two-time cancer survivor, an avid gardener and a bit of a health food nut. Her enthusiasm for eating healthy is contagious, although contagious is not really the correct word to correlate with healthy. Let’s just say she is convincing. And she does not simply talk the talk. This 36-year-old nurse practitioner by profession and parish nurse via volunteerism eats healthy and is leading healthy living workshops, offering food samples and recipes, striving to drive home her message. She cans and freezes all that produce goodness grown on the rural acreage she shares with her husband, Jeff, east of Faribault. And then she gives it away. Not everything. But plenty. Just a few days ago, while attending bible study at Mandy and Jeff’s house, I left with two 16-ounce pouches of frozen pumpkin and another packet of green beans. Only two days earlier she had handed me two sealed pouches of still-warm-from-the-oven pumpkin. My friend insisted that none of us should buy canned pumpkin and I had to confess that I had two cans in the cupboard. Mandy said she would forgive me this time. And just to prove that healthy eating can be as tasty as she claims, Mandy served our bible study group two pies. Not until afterward, however, did she reveal that both include tofu. I knew, though, as Mandy had informed me ahead of time and I’ve actually made the chocolate pie several times. So, if you are looking for a healthier alternative to the typical pies you may be baking for Thanksgiving, here are two recipes that will fool those tofu naysayers. I’m making these. But not until after my brother-in-law and a few other family members have finished off their slices of pie will I reveal the ingredients. Or, perhaps I should remain silent. 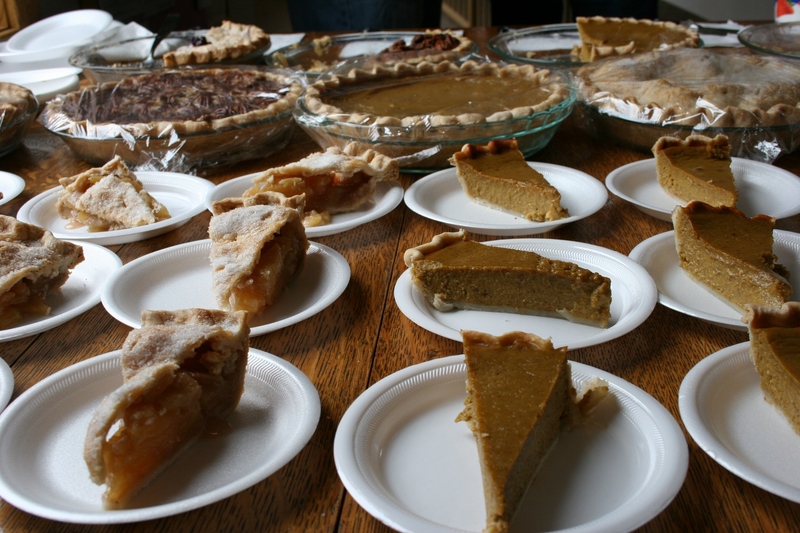 Pumpkin and other pies, not the healthy variety that includes tofu, at an event I attended last year. Preparation: Preheat oven to 425 degrees. In a mixing bowl, cream together pumpkin and sugar. Add salt, spices and tofu; mix thoroughly until smooth. Pour mixture into pie shell and bake 15 minutes. Reduce heat to 350 degrees and bake for an additional 40 – 50 minutes. Chill and serve. Makes 8 servings. 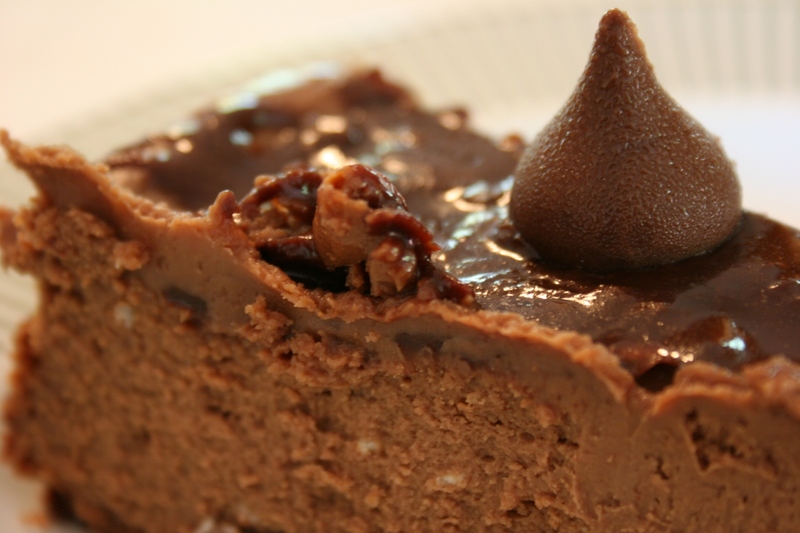 You could choose to make this calorie and fat-laden (but super delicous) chocolate cheesecake or try the healthier chocoloate pie recipe below. Cheesecake is my favorite dessert and I will never give it up, FYI. Blend the soft silken tofu in a blender until smooth. Add vanilla. Blend again. Melt chocolate. Add chocolate to tofu in blender and blend until thoroughly mixed. Pour into pie crust. Refrigerate 1 – 2 hours. May top with sliced strawberries and chopped walnuts if desired. I HAVE MADE the chocolate pie several times to rave reviews from guests and the husband and teenage son, who likely would not have tried this had they heard the word “tofu.” This pie is super simple to make and delicious. Make certain you purchase soft silken tofu, not firm, if you make these recipes. I have not made the pumpkin pie, but can vouch that it tastes just like regular pumpkin pie and was especially delicious with pumpkin from Mandy’s garden. Note that I shopped at two different grocery stores here in Faribault during the last several days for soft silken tofu without success. The one Faribault grocery store where I’ve purchased tofu in the past was out of the soft variety. The other store never carries it, nor do two other grocery stores in town. My point: Plan ahead. 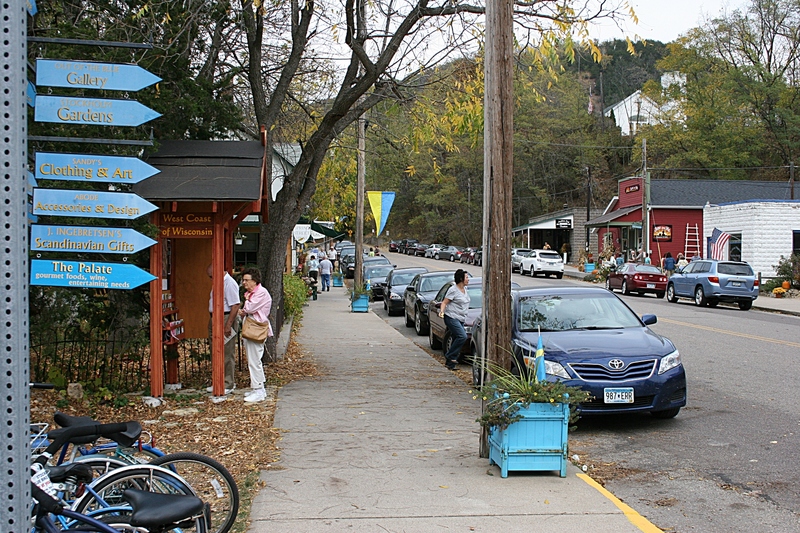 Shops, eateries and more line the streets of Stockholm, a quaint village along Lake Pepin. This photo was taken in early October. To the left you'll see blue bikes, available for visitors to use at no cost. If only I had known about the bribe. Are you a writer, blogger, reviewer, photographer with a web site? Let us bribe you (how about a fresh cup of expresso from Stockholm General, a piece of pie from the Stockholm Pie Company, lunch at Bogus Creek Café, a beer at Gelly’s, a ticket to an event at the Widespot?) in exchange for your coverage! Yes. Yes. Yes. Yes. And, yes. While I’ve never drank an expresso, I’m certainly open to trying one. I like pie. A lot. I do lunch. Yes, I’ll toast your town with an icy mug of beer. And, yes, I always enjoy being entertained. 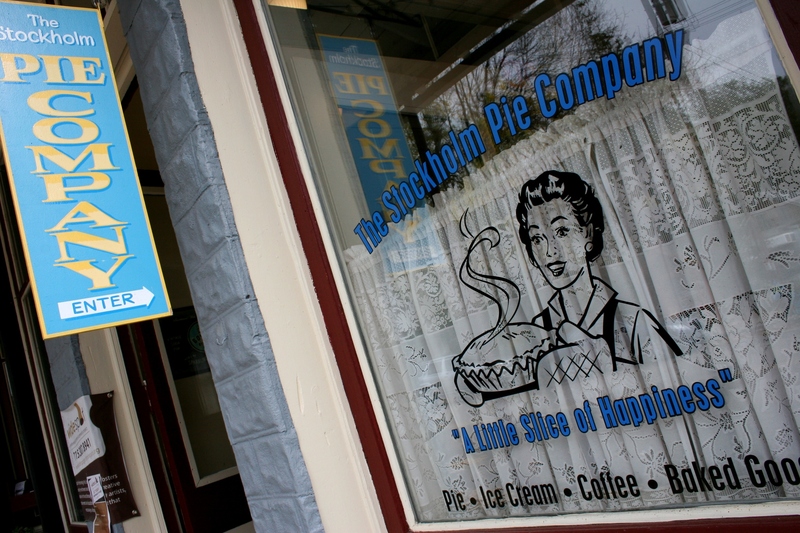 I was too full from lunch across the river in Wabasha to try the Stockholm Pie Company's pie, made completely from scratch. Not that I wasn't tempted to try a slice of caramel apple crunch or key lime or peanut butter fudge. I even stepped inside this tiny shop to smell the baking pies. Next time I'll save room for dessert. However, dear people of Stockholm (Wisconsin. Not Sweden.) and dear readers of Minnesota Prairie Roots, my writing has not been influenced, not one teeny bit, by offers of free anything. My three previous, glowing posts from Stockholm were written from the heart. 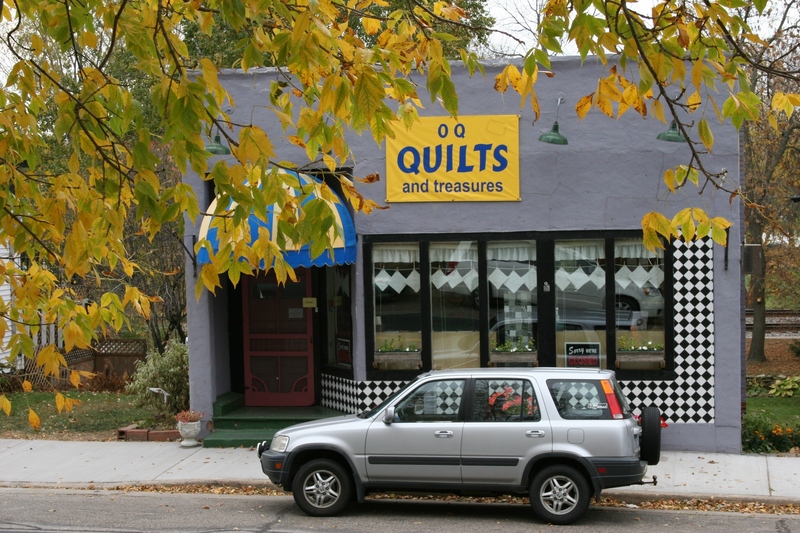 Simply put, I fell head-over-heels for this quaint Lake Pepin-side village of 89 without any undue influence. Today I’ll take you on one last visit to this destination town just across the Mississippi River from Minnesota. Enjoy. And if you’ve been to Stockholm, Wisconsin, not Sweden, I’d like to hear what you most appreciate/relish/savor about this riverside get-away. And if you own a business or live in Stockholm, submit a comment and tell readers why you love your village and why they should visit. One of the many shops lining the streets of Stockholm. 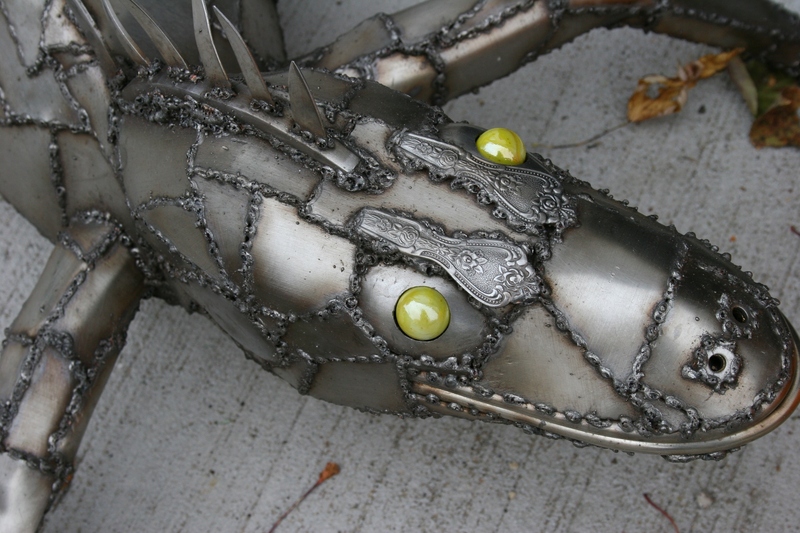 One of my favorite finds, a lizzard crafted from old silverware and more and lounging outside a shop. No, I didn't purchase this critter, but I certainly admired the creativity. I notice details, especially signs, windows and doors, including this door on the Stockholm Museum. 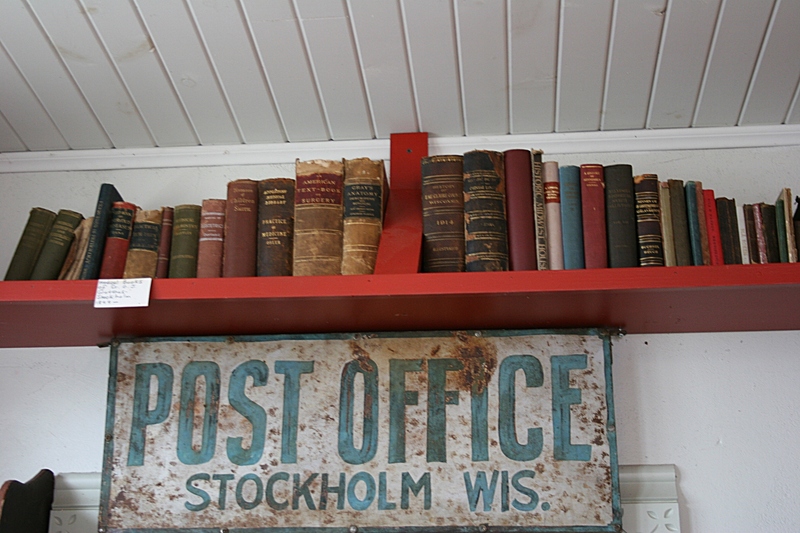 The Stockholm Museum, home to the Stockholm Institute which preserves and celebrates the history of the Stockholm area, is housed in a former post office. 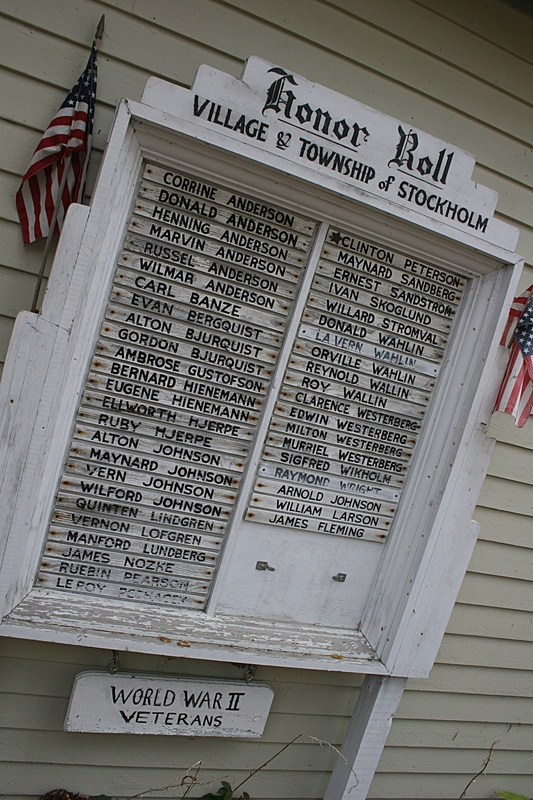 On the museum exterior, I discovered this handcrafted tribute to WW II vets. 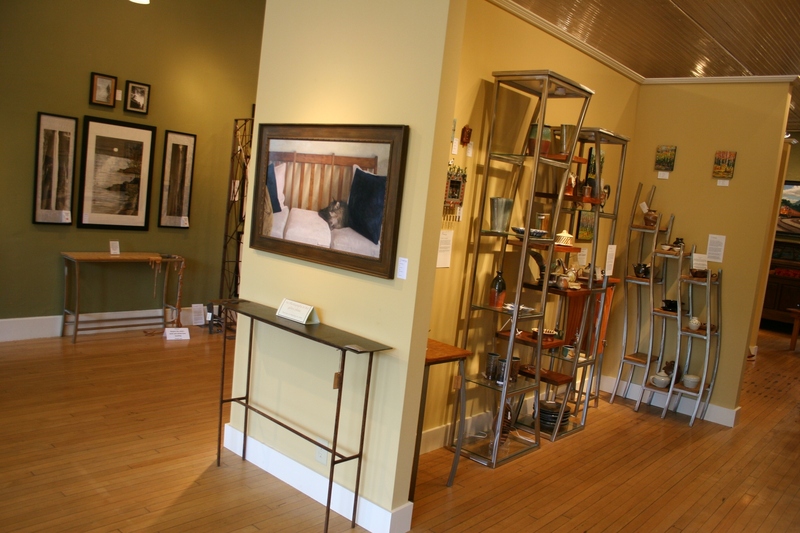 The lovely Abode gallery, where my artist friend Arlene Rolf of Faribault has artwork displayed. Another business door and signage that caught my eye. It's all about the details, my friends, all about the details. A residence, I assume, since the steps were marked with a "private" sign. So inviting and lovely, just like all of Stockholm. UP UNTIL SUNDAY, Tomah, Wisconsin, meant little to me except as the half-way point between my home 2 ½ hours away in southeastern Minnesota and my daughter Miranda’s home 2 ½ hours away in eastern Wisconsin. 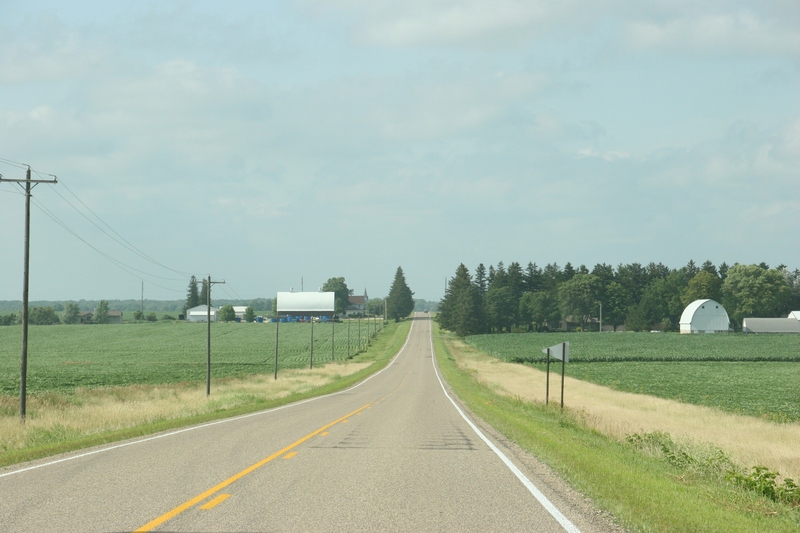 Located near the intersection of Interstates 90 and 94, this town of around 10,000 has been the ideal place to stop and stretch before jumping onto two-lane, wood-edged Wisconsin State Highway 21 which runs through umpteen mostly tiny towns all the way to Oshkosh. Not that I have an issue with small towns and woods and such. But if you want to make time and avoid deer, this highway is not the one to take. Sorry, I got sidetracked there for a minute thinking of the long stretches of woods without a home in sight, miles and miles without cell phone service, cranberry bogs hugging the roadway, dead muskrats and dead deer. Oh, and one other tidbit you should know about Highway 21. Amish travel this narrow and busy state highway. In their buggies. Day or night. And especially on Sundays. But back to Tomah, which, by the way, also happens to have a fabulous cheese shop, Humbird Cheese, conveniently positioned right off I-94 at its intersection with Highway 21. 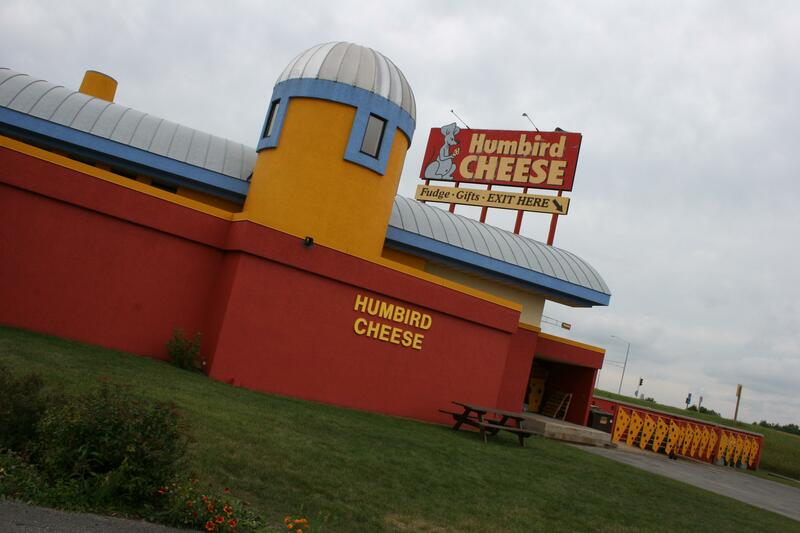 Humbird Cheese, a popular tourist stop at Tomah, Wisconsin. On Sunday, I wasn’t looking for a cheese shop, but rather a place where my husband and I could meet our daughter and her friend Gerardo for lunch and a car swap. That’s how we ended up at Burnstad’s European Restaurant, Village and Pub. I found information about this shopping and eating complex online and determined it would be the ideal place to connect. If one or the other of us had to wait, we’d have something to do. Burnstad’s, as it turns out, offers plenty of time-killing shopping options. I was most happy to see Amish products sold here as I am fascinated by the Amish. Not that I bought anything Amish, like a log of Amish butter or cheese or chocolate candy or egg noodles or preserves. 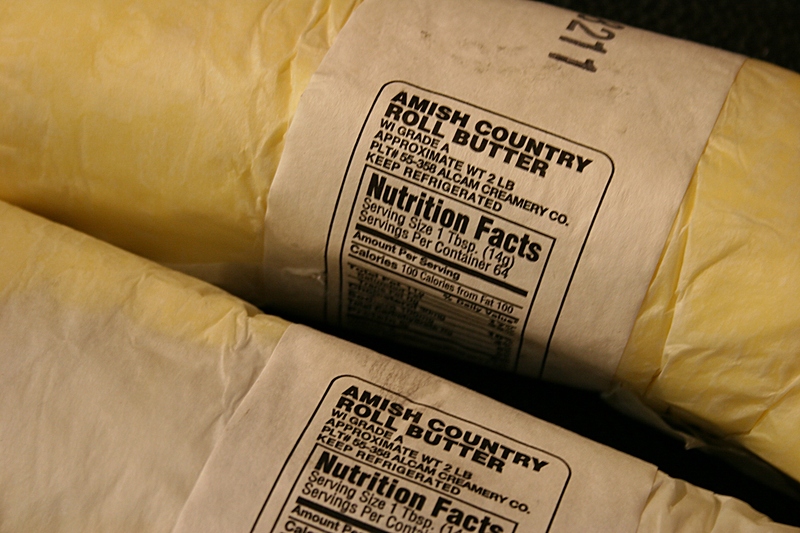 Amish Country Roll Butter from ALCAM Creamery Co. and sold at Burnstad's. 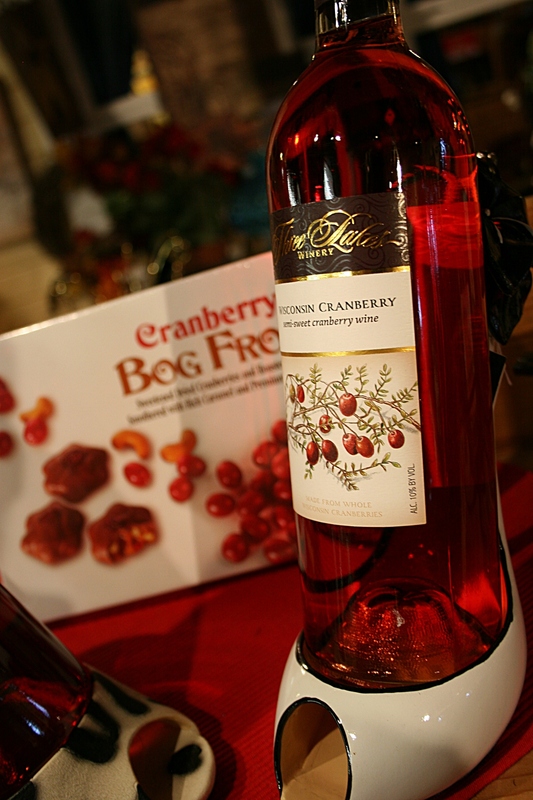 Wisconsin cranberry wine displayed in, of all things, a high-heeled shoe. Huh? 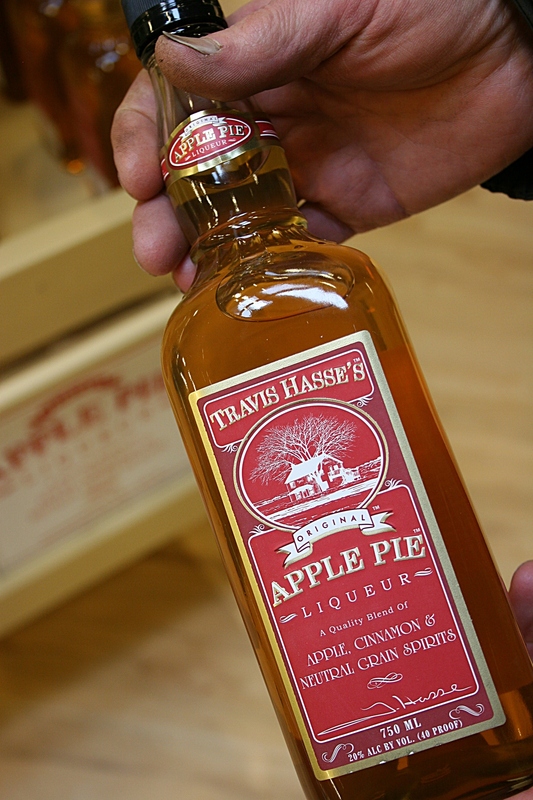 "People are looking at you," my husband said when I asked him to hold this bottle of Apple Pie Liqueur so I could photograph it. I replied: "I don't care. I'll never see them again." All that aside, Burnstad’s rates as one impressive place. Impresssive to me primarily because of the atmosphere—including a cobblestone pathway meandering past the restaurant and pub and gift shops—and cleanliness. Honestly, in the European market/grocery store, the spotless, shiny floor reflected like a lake surface on a calm and sunny summer afternoon. I’ve never seen such a clean floor in a grocery store, or maybe anywhere. I didn't photograph the floor of the grocery store, because shoppers really would have stared at me. 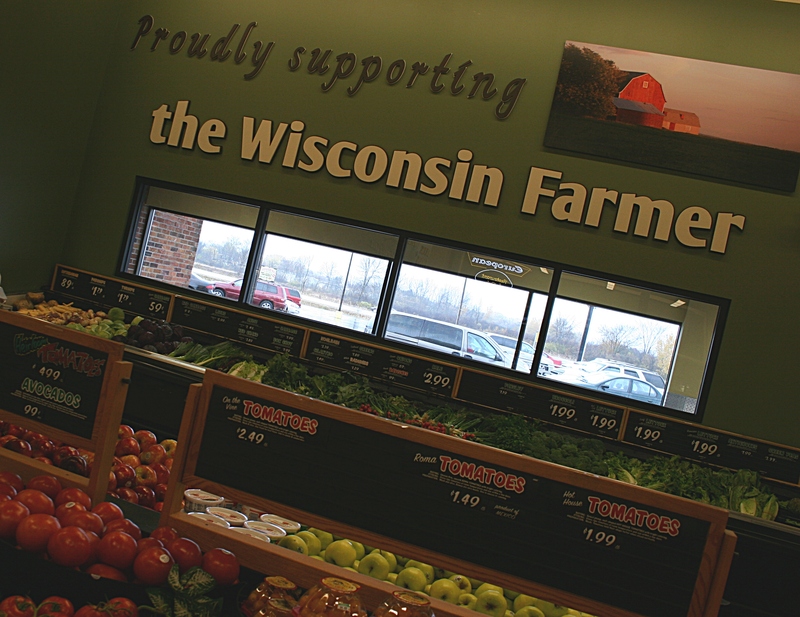 But I did photograph this sign, which so impressed me with its support of Wisconsin farmers. Then there’s the pie. Oh, the pie. Typically my family doesn’t order dessert in a restaurant. But the pie in the rotating display case proved too tempting, especially when I inquired and learned that the pies are made fresh daily. So Miranda and Gerardo each selected a piece—Door County cherry and rhubarb/raspberry—which the four of us promptly devoured. We were celebrating Gerardo’s October 29 birthday and Miranda’s soon-to-be birthday. 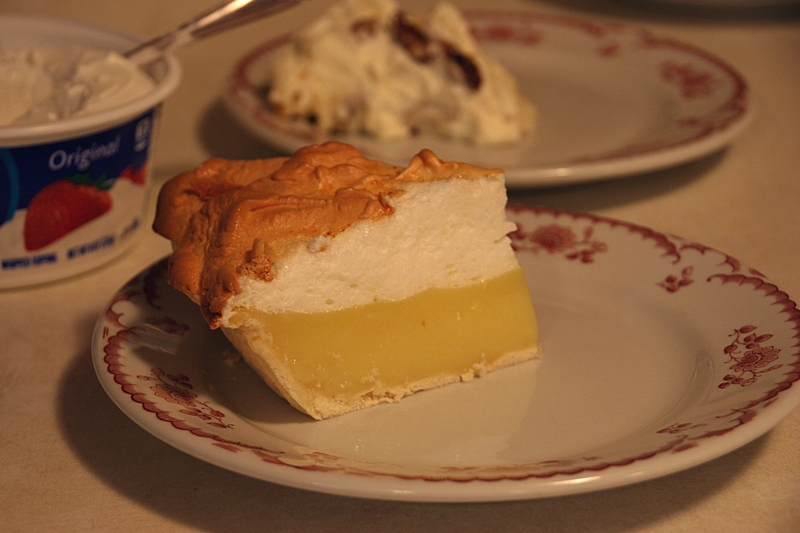 If you like pie, Burnstad’s pie is the pie to try. I wonder if it’s made by the Amish? Speaking of which, right outside the gift shop entrance you’ll see an Amish buggy. I wanted Miranda and Gerardo to pose for a photo. My daughter was having none of that. Since I’m the one semi-possessed by all things Amish, she insisted I climb into the buggy for a photo op. I refused to wedge myself inside the close confines of that buggy. So instead, I stood next to it and smiled a tourist smile like any good Minnesotan would. 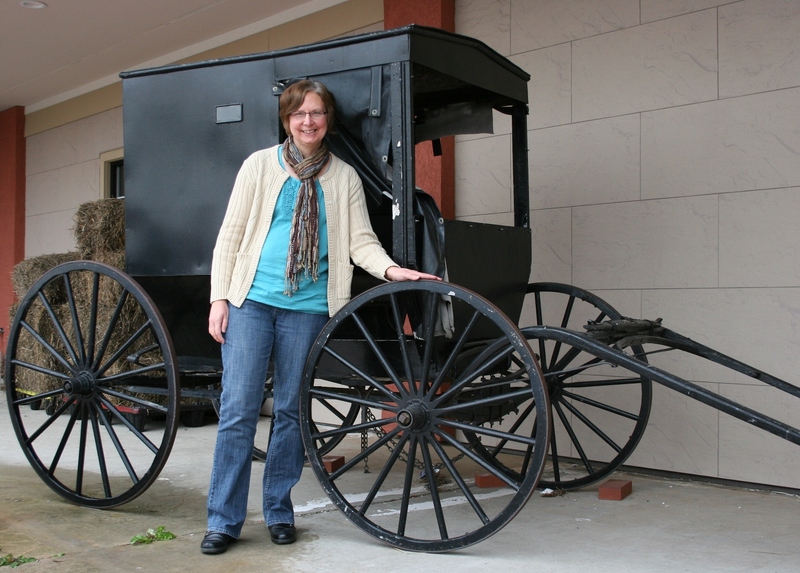 I put on my tourist face for this Amish buggy photo. 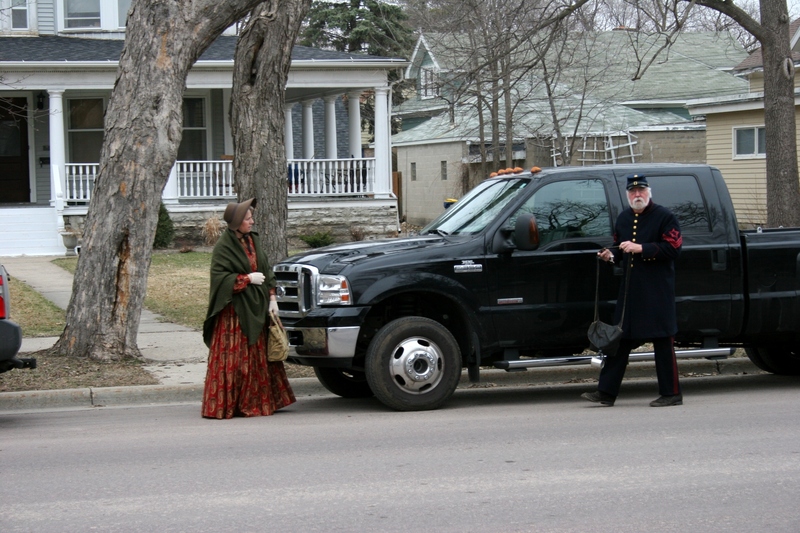 Just down Highway 21 you'll see authentic Amish buggies. 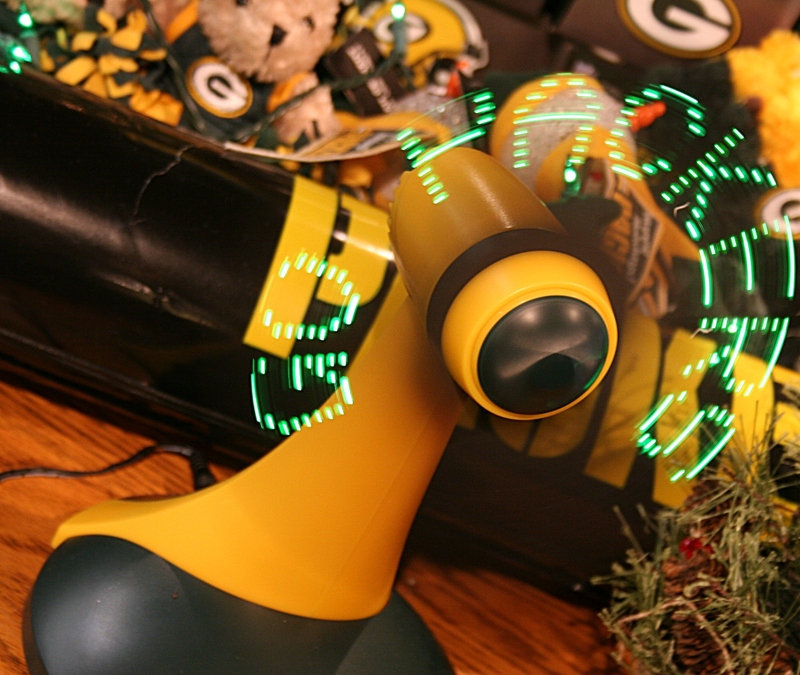 Packers fans will find Packers fans for sale in Burnstad's gift shop, in the Packers section. 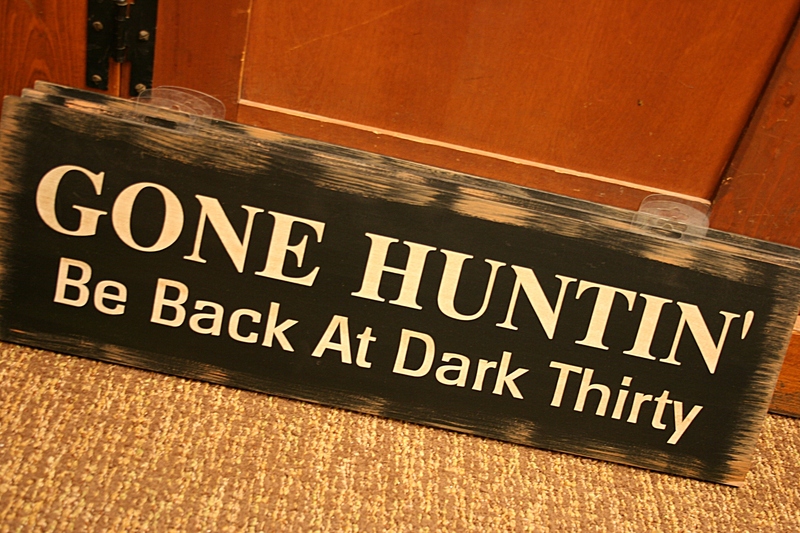 A particularly amusing sign I spotted in the gift shop and suitable for either a Minnesotan or a Wisconsinite. SORRY FOR FAILING to photograph exterior and interior shots of Burnstad’s. I was just too excited about seeing my daughter for the first time in three months that I didn’t get carried away with photo-taking like I typically do. 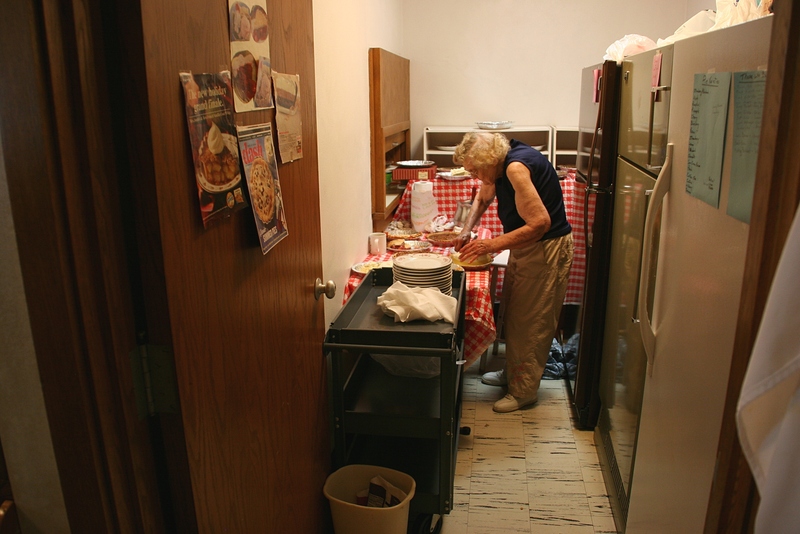 Elsie Keller in The Pie Room, a space so small that this petite woman can barely fit her stool into the room. 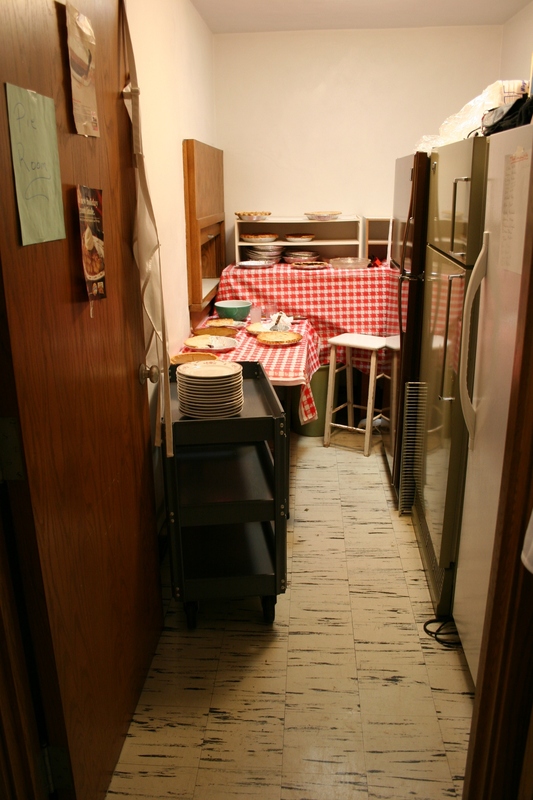 "The Pie Room" labeled as such by a hand-written sign hanging on the door, is narrow as a galley kitchen. 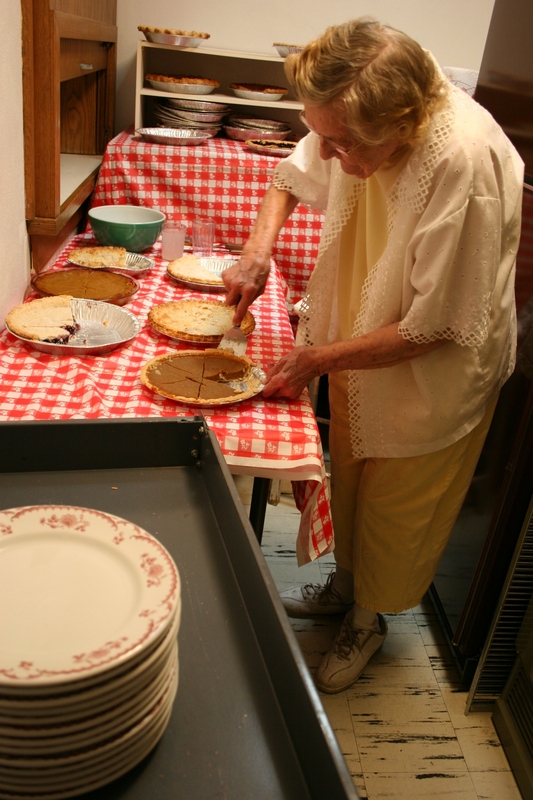 ELSIE KELLER HAS BEEN at the country church for hours already when I discover “The Pie Room” at St. John’s United Church of Christ, Wheeling Township, and slip inside. 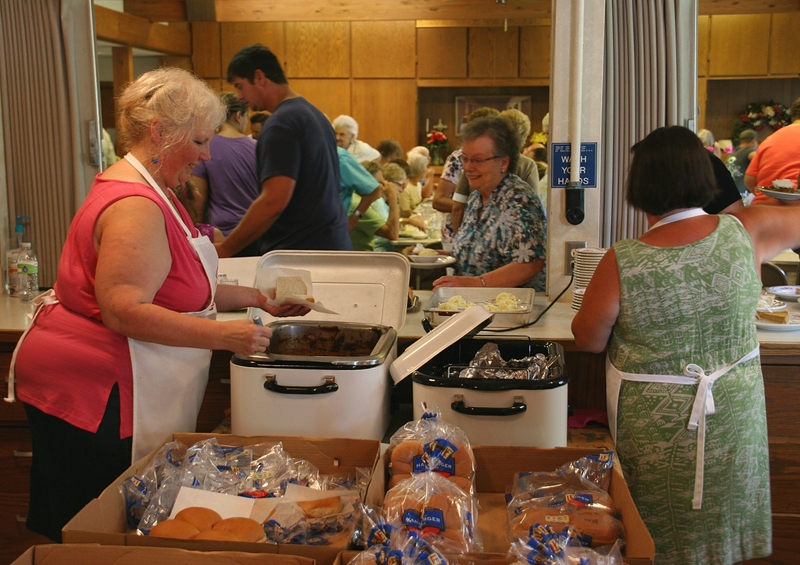 Sandwiched between the social room and a hallway into the fellowship hall, this galley way serves as 85-year-old Elsie’s work station during the Nerstrand area congregation’s annual Ice Cream Social. 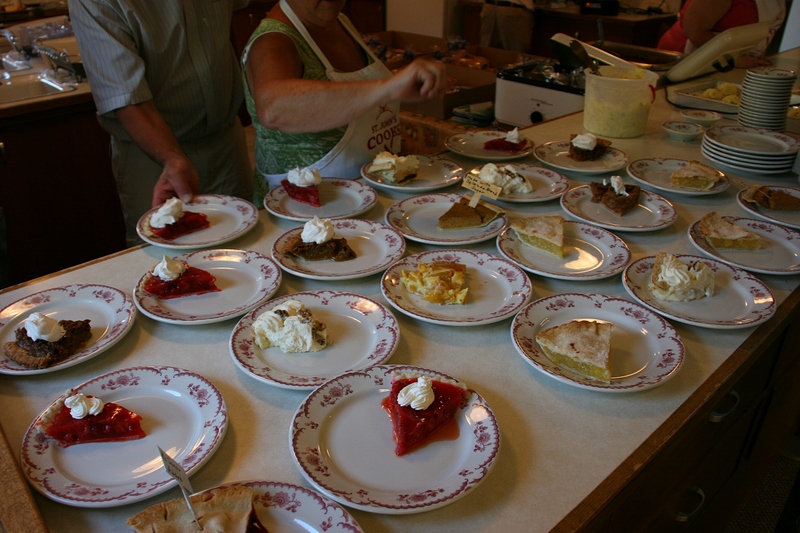 For some four decades—so says Elsie’s son, Craig Keller, because his mother has lost count—this petite farm woman has sliced and plated the (mostly) homemade pies donated by church members. On this Sunday, they’ve brought 43 pies for the long-time summer event sponsored by the youth fellowship group. 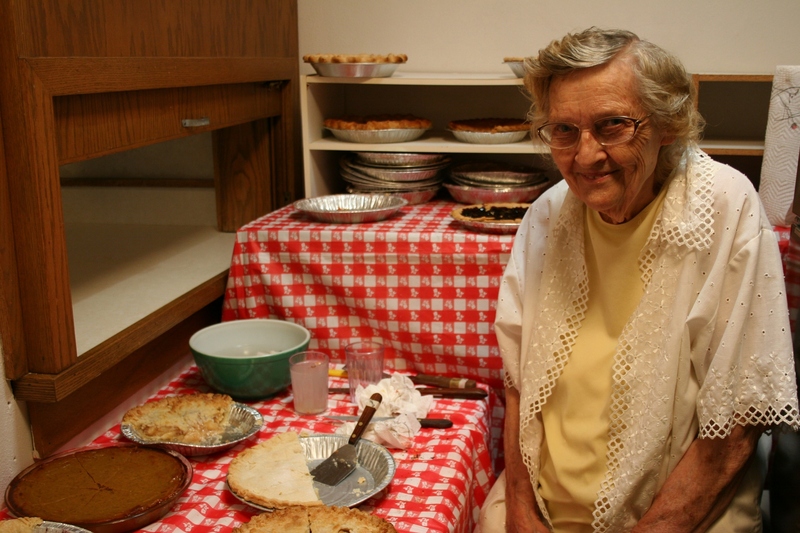 With a fan positioned outside The Pie Room, Elsie settles onto a tabletop-high wooden stool, pies to her right, pies in front of her and frozen pies to her left, back in a freezer. A stack of hefty plates are positioned on a cart nearby. Two lists are also taped onto a freezer—one a list of pies, the other a list of pie donors like Mildred Tatge, Norma Meyer and Diane Bauer. The Kellers have brought three chocolate and three strawberry pies. 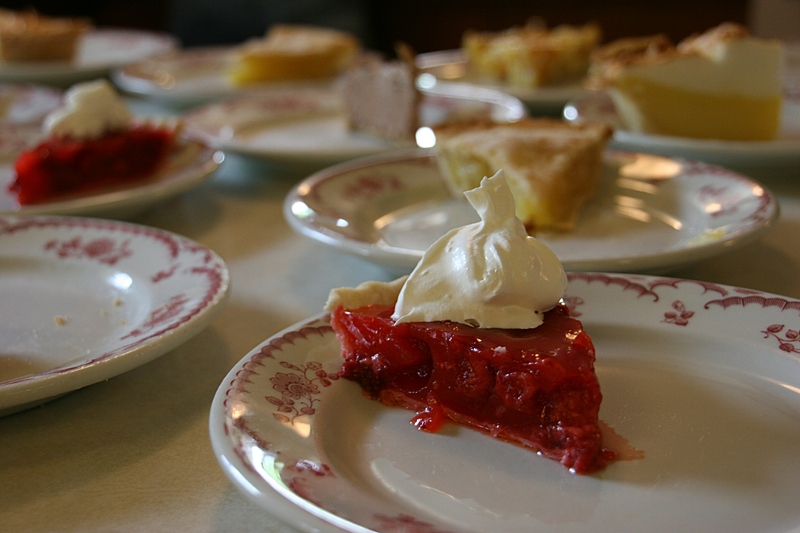 Elsie made the Crisco crusts (no lard for her; I ask) for the berry pies and Craig made the fillings for all six. 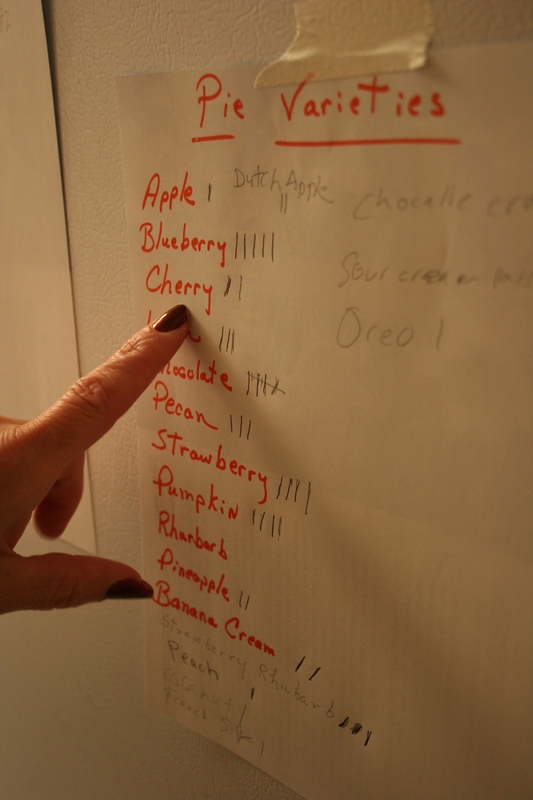 The master list of donated pies hangs on a freezer in The Pie Room. I’m told, not by Elsie but by another volunteer, that some of those attending the Ice Cream Social will request a specific pie made by a specific person. Lemon meringue, Elsie’s favorite, is already gone by the time I arrive around 6 p.m.
Diners line up at the kitchen counter to first select a piece of pie, carefully positioned to one side of a dinner plate, before choosing from the other a la carte menu items of BBQs, ham sandwiches, potato salad, cake, ice cream and sundaes. She also loves the church where she was baptized, confirmed and married, belongs to the Women’s Guild and teams up with another member each fall to prepare the German potato salad for St. John’s annual German Fest, this year on Sunday, September 25. Elsie reminds me several times that I should come for German Fest and I promise I will try to be there. Then a teenaged boy interrupts, tells Elsie he needs more pie. She grips the edge of a pie tin in her left hand, slides a spatula under a generous piece of pumpkin pie with her right hand and deftly slips it onto a plate. 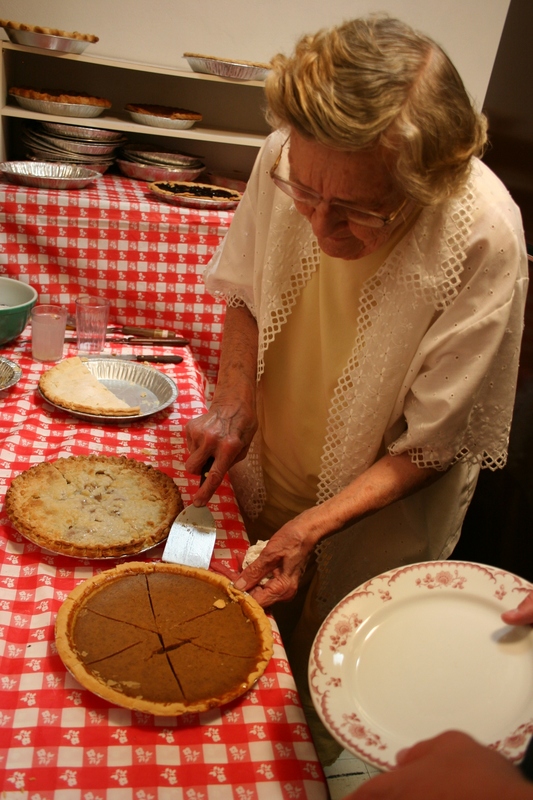 A member of St. John's Youth Fellowship waits, plate in hand, for a slice of pumpkin pie scooped up by Elsie. Elsie, a wisp of a woman, works on putting more pumpkin pie onto plates. By the end of the day, Elsie will have blisters on her hand from cutting pies. Here she scoops a slice of apple pie. 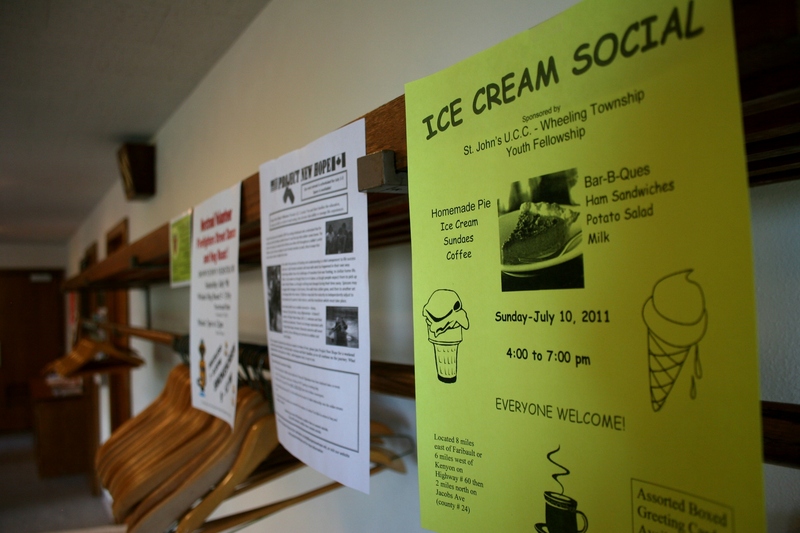 Signs hanging from the coat rack in the narthex advertise the Ice Cream Social and other area events. Pies await diners on the kitchen counter. Diners make their selections from the a la carte menu. 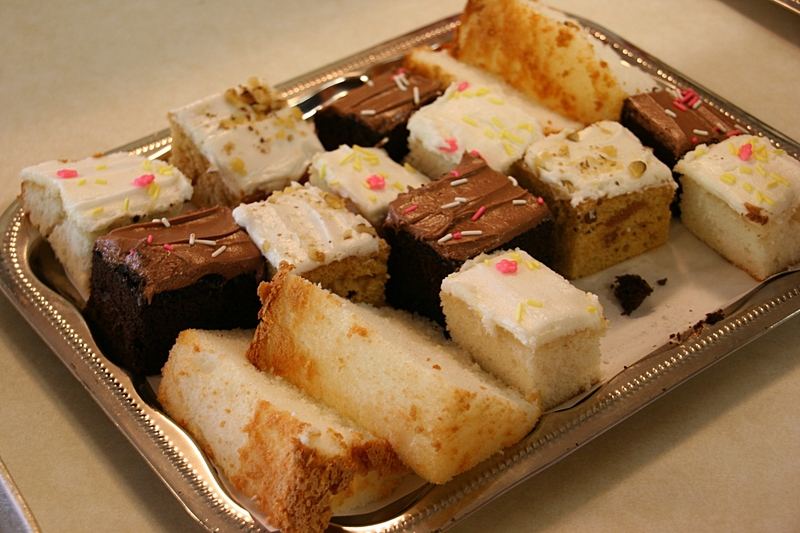 Cake slices arranged on serving trays are among the dessert options. 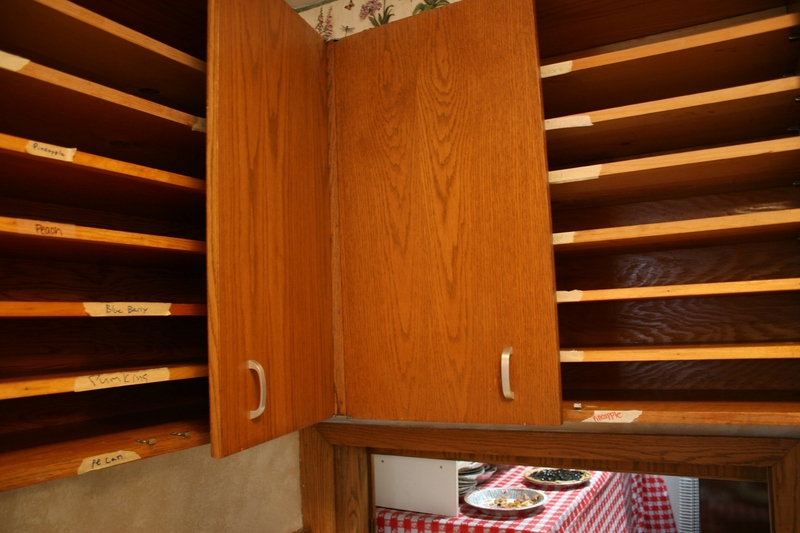 Labeled shelves, for storing the pies, are empty by the end of the Ice Cream Social. 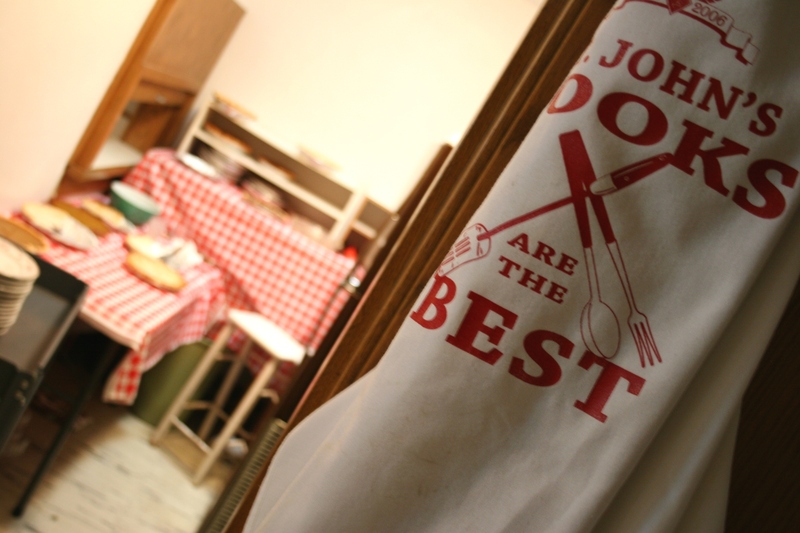 Many of the volunteers wear "St. John's Cooks Are the Best" aprons like this one hanging on a door by The Pie Room. Having eaten at St. John's several times now, I heartily agree with that statement. I EXPECT YOU have no clue what you are viewing above. Perhaps you think this is a piece of art in a gallery exhibit. You would be wrong. Way wrong. 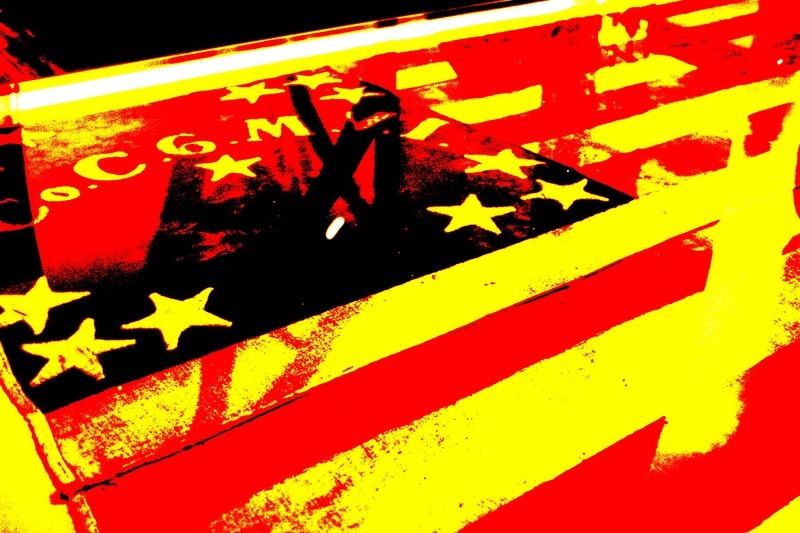 Rather, this shows a portion of a Civil War battle flag that I’ve switched up with some photo editing tools to emphasize the stars and letters and numbers in the upper left corner. Lighting conditions weren’t ideal for photographing this flag Saturday afternoon in the Guild House at the Cathedral of Our Merciful Saviour in Faribault. Honestly, I hadn’t even expected to photograph this flag sewn by a group of women in Fairmont and carried by Company C, 6th Minnesota Volunteer Infantry. The last time I asked to photograph the flag at the Rice County Museum of History, my request was denied by director Susan Garwood. She didn’t know me from Adam, or Eve, although I gave her my business card and explained that I was a writer and blogger. That didn’t matter. Thankfully, Garwood changed her mind and I got the go-ahead-and-shoot-but-without-flash OK.
Garwood has reason to be cautious. This battle flag is rare, among about a half dozen in Minnesota. 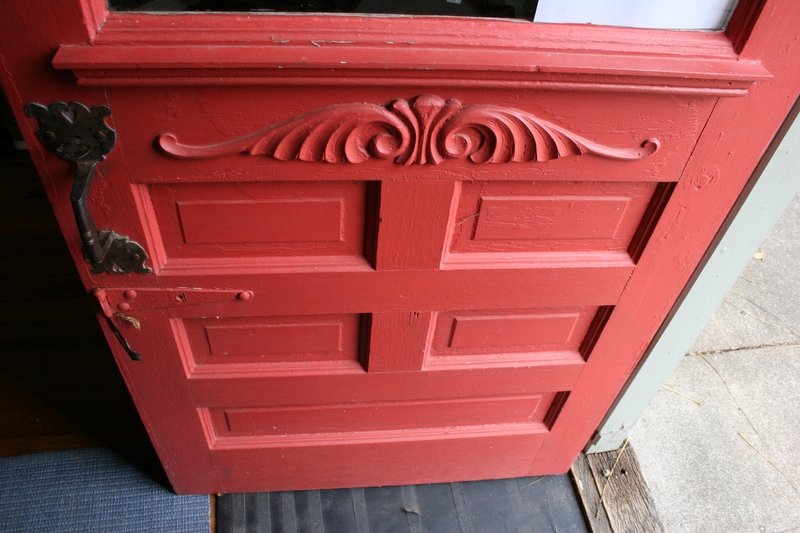 Recent restoration cost nearly $7,300. Here's how the flag really looks. Faded. The company which carried this flag was comprised of men primarily from Bridgewater Township in Rice County, Minnesota. 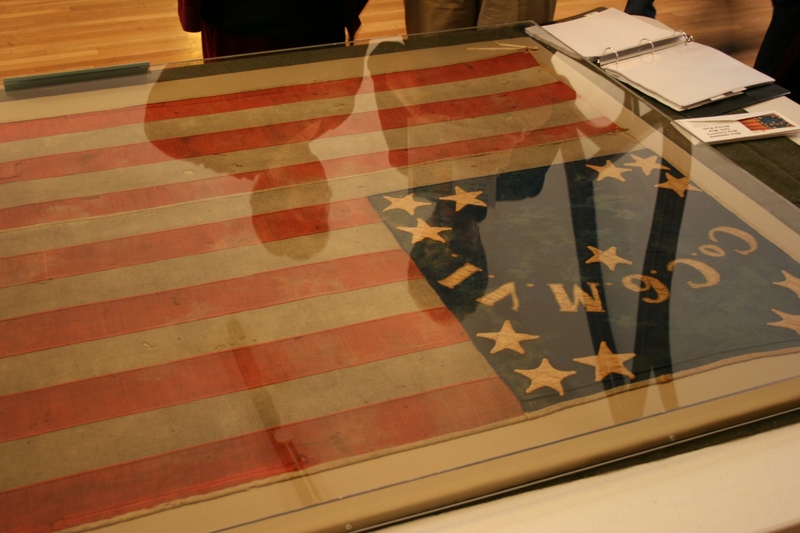 On the back side of the flag 34 stars are sewn representing the number of states in 1862. You are seeing reflections here on the glass encasing the flag. Just another, upside down, view of the flag and the reflections of visitors viewing it. 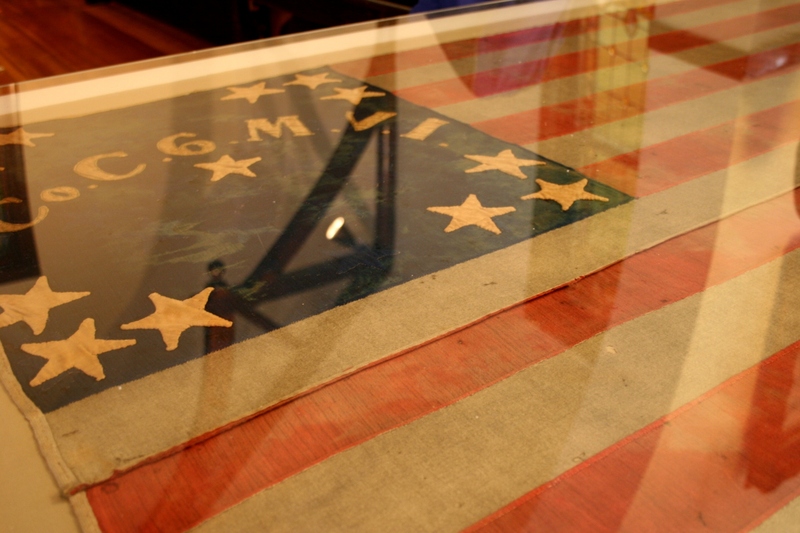 I don’t know the value of the restored flag. But it is valuable enough that a Faribault police officer was guarding the flag Saturday afternoon during “Recognition of the Fall of Fort Sumter–The Beginning of the Civil War” sponsored by the Rice County Historical Society and the Cannon Valley Civil War Roundtable. 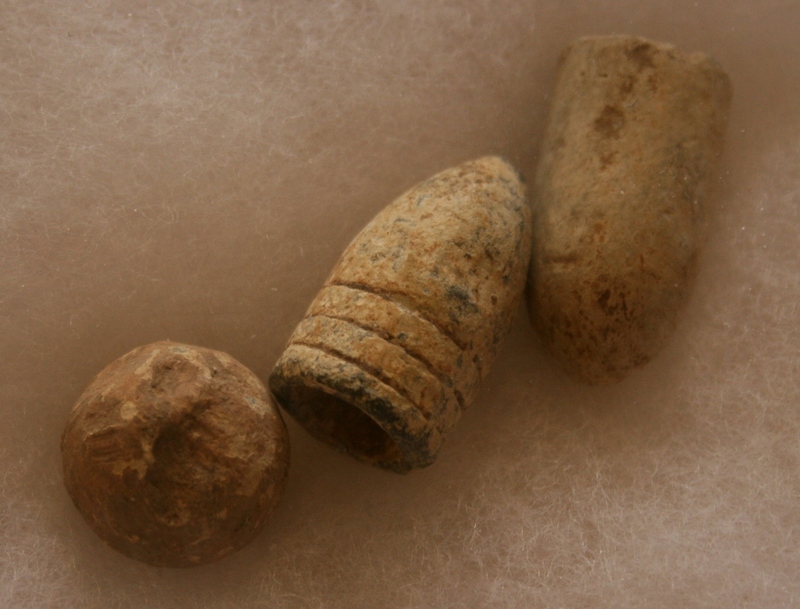 Likewise a collector of Civil War era artifacts was standing guard over his tables full of treasures. He had, among Civil War uniform buttons and other items, an original Lincoln photo engraving (used on the $50 bill) and signature. I didn’t ask the values. Sometimes it’s better not to know these things. 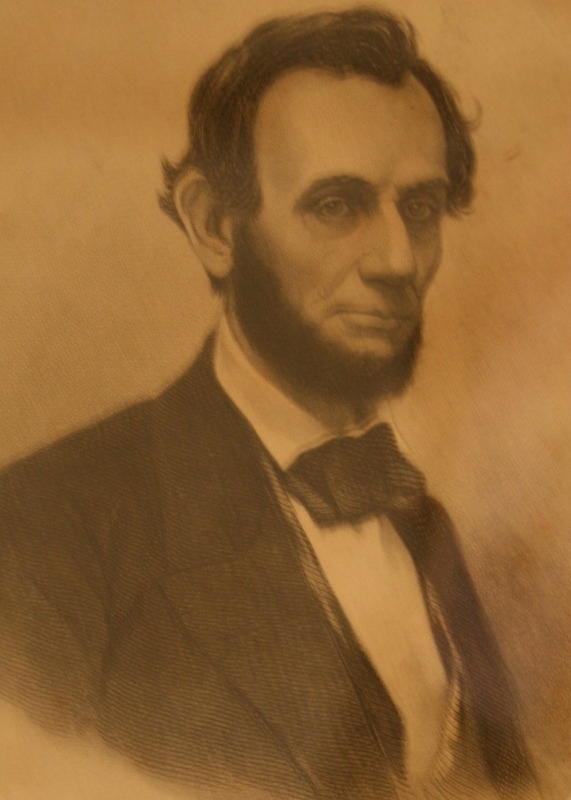 A slightly out of focus photo that I took of an original Lincoln photo engraving for a $50 bill on display Saturday. The last time I photographed parts of his collection at a 2009 Cannon Valley Civil War Roundtable meeting, he made me promise not to reveal his name. I agreed. I didn’t want to go missing and have my family looking for me under a stadium. That’s an exaggeration, but this collector was serious. My lips are sealed. I did ask him, though, why he didn’t bring his slave bills, which were advertised as being at the event and one of the key reasons I attended. He simply said he didn’t know he was supposed to bring them. He gave the same answer 1 1/2 years ago at the Roundtable meeting. I had gone to the session then specifically to see the slave documents. 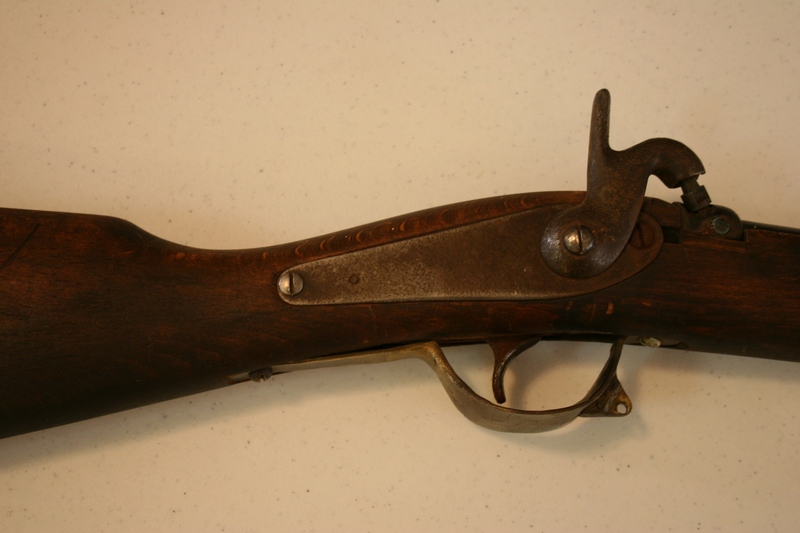 and two Civil War era muzzleloaders which I was allowed to pick up and which were heavy at 18 and 21 pounds. 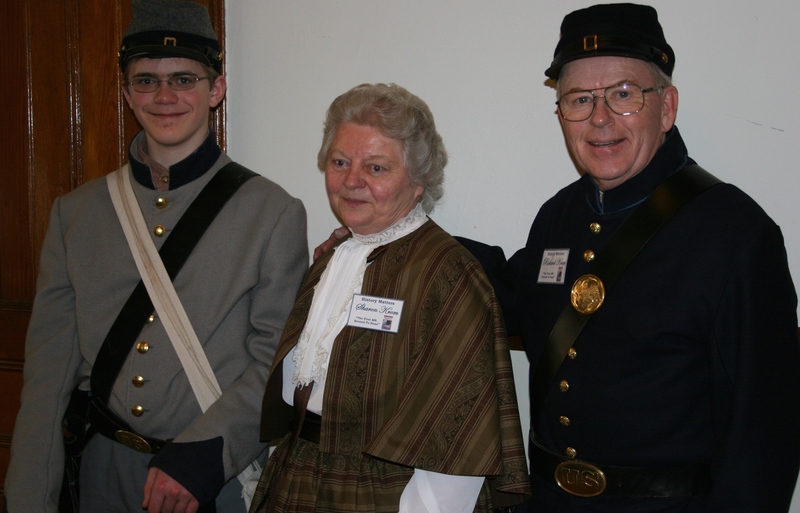 and this unidentified reenactor, left, posing for photos with Sharon and Richard G. Krom of Rochester. Richard is the great grandson of a Civil War soldier and has written a book, The 1st MN Second to None. Fortunately for me, Jason had baked my favorite pie and apparently a favorite of many as everyone sitting at my table chose blueberry pie over apple, pumpkin or pecan. 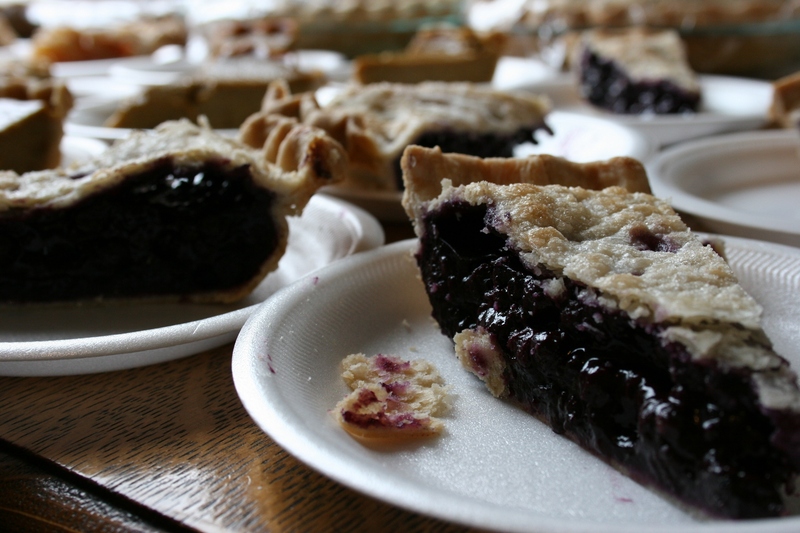 Most of us wondered if the blueberries were wild, yet never bothered to walk over and ask the pie-maker. Jason wondered why I was photographing his pie. I just handed him a business card and figured he’d figure it out.